Eugene Taylor, bass; Louis Hayes, drums. 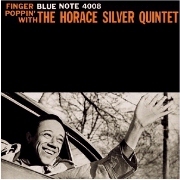 In the period since he broke away from the Jazz Messengers to express his own ideas as a pianist-composer, Horace Silver has made considerable porogress on both the musical and the commercial level. His discovery of new approaches to old forms, as demonstrated in such themes as "The Preacher" and "Senor Blues," has led to a sudden access of recognition in the role of songwriter as his works have been played by artists far from his own particular field of jazz. "Finger Poppin'," [mp3] the title tune of the album, denotes a process that is mandatory when the Silver group is within earshot. The number is a jump theme with regular construction in eight-bar blocks, the horns exposing it in rapid-fire unison. To those for whom this may be their introduction to Blue Mitchell, a surprise is in store; even fans already acquainted with his earlier work will be struck by the Clifford Brown-like confidence and the Fats Navarro-esque smoothness of the phrasing. "Juicy Lucy" was described by Horace as "a bluesy number in moderate tempo, based on a blues feeling but not the blues changes." Notice how Junior Cook settles into a simpler and more blues-based groove after the multi-noted ending of Blue's chorus. "Swingin' The Samba," as Horace points out, is "a legitimate samba all the way through, on a minor theme. I was particularly happy with the way this came out. The melody is very simple and it swings nicely, I think, with good solos." This is one of the Silver Quintet's most cohesive works to date. "Sweet Stuff," which closes the first side, is "just a trio number, me and Louis Hayes and Gene Taylor, playing a ballad I wrote." The lyrical nature of the minor theme is stressed by the ingenious weaving of bass and drums into the pattern of its exposition. Of "Cookin' At The Continental," Horace recalls, "We used to play that out at the Continental in Brooklyn. It's a fast blues." The horns live up to their appropriate names through this track; Junior cooks and Mitchell's blue. Horace delivers himself of some of his funkiest thoughts in a solo that makes intensifying use of a repeated phrase toward the end. A unison-horn ending is accentuated by the effective use of Louis's press-roll. "Come On Home" is a minor blues, played with a two-beat insinuation that inevitably launches a series of stark and soaring solos by Blue, Junior and Horace. That Junior has heard Sonny Rollins is often evident at certain points in this album; that he also acknowledges the contributions of Wardell Gray and Sonny Stitt may be discerened at other moments. "You Happened My Way" is, to quote the composer again, "a very, very slow ballad." There is nothing melodically complex here, the basic mood being attractively simple. As for the odd bar structure, Horace says, "I don't stop to think about measures until after I'm finished writing. As long as they feel even and comfortable, that's all that counts." "Mellow D" is "a fast jump number, a 24-bar theme. It took the cats a little while to figure out just where they were on this, but we played it for a while to get the hang of it and finally everybody had a ball blowing on it." The eight performances presented here are as much the voice of one man as they are the multiple voice of the group that interprets his ideas. Horace has found, in his current quintet, an outlet that gives him the ideal medium for the expression of his melodic creativity--a window, rather than a door, opening onto his particularly dynamic world of modern jazz.